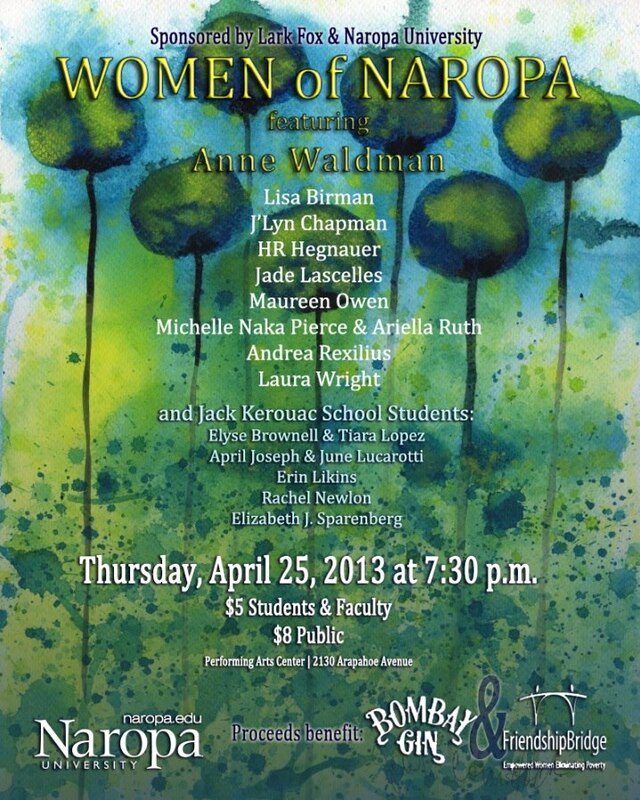 Bombay Gin editorial board would like to invite you to Thursday’s Women of Naropa Reading! Along with the earth-shaking Anne Waldman, the night will include performances by Lisa Birman, HR Hegnauer, Maureen Owen, Andrea Rexilius, Laura Wright, and a collaboration between Michelle Naka Piece and Ariella Ruth. Attendees will also enjoy readings by Bombay Gin’s own editor-in-chief J’Lyn Chapman and editor Jade Lascelles, as well as a collaborative performance by Bombay Gin editors and Jack Kerouac School (JKS) students June Lucarotti and April Joseph. This event offers a rare opportunity for JKS students to share the stage with celebrated faculty, providing an exciting showcase. The audience will be graced by performances from additional JKS students Erin Likins, Rachel Newlon, Elizabeth J. Sparenberg, and a collaboration between Elyse Brownell and Tiara Lopez.